For defense attorney Samantha Brinkman, it’s not about guilt or innocence—it’s about making sure her clients walk. But the case of Cassie Sonnenberg touches a raw nerve in Sam that makes it painfully personal. A savage attack in a suburban home has left a father and son fatally stabbed, and a mother clinging to life. And Cassie, the family’s adopted teenage daughter, is accused of the bloody crime. It’s a tabloid-ready case that has the nation in an uproar—and Sam facing her biggest challenge. But when she learns the murders were sparked by years of sexual abuse, she doubles down to get Cassie exonerated. Yet, even as Sam probes the secret past of a seemingly happy family, the dark memories of her own tormented life threaten to consume her. And as Cassie’s story keeps twisting at every turn, in troubling new directions, Sam must fight all the harder to separate dangerous lies from the terrifying truth. Samantha Brinkman is a defense attorney, and this is good news for Cassie Sonnenberg. Cassie is desperate need of help when she is accused of murdering her adoptive father and brother and nearly killing her mother as well. 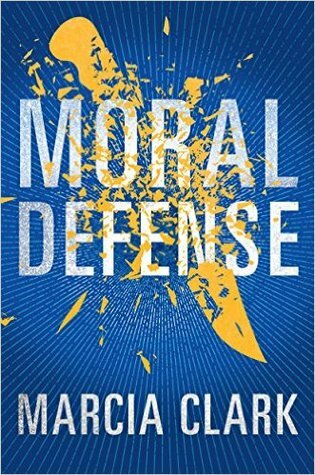 In Moral Defense, by Marcia Clark, Samantha seeks to find the truth behind the murders and to clear up some of the other cases that could get her killed. 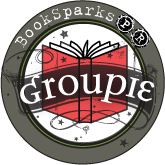 Though I did not read the first book in this series, picking up characters was no problem. Samantha Brinkman runs an office with her investigator, Alex, and her assistant, Michelle. Samantha is asked by a friend to be Cassie’s legal advocate. When incriminating evidence is found that implicates Cassie, Samantha tries to understand her client and to get her off the hook. In addition, because of her morally ambiguous choices, Samantha has to try to find a way to procure some drugs or cash to make a long-standing problem go away. Add a container full of immigrants to the mix of problems (along with some gang members), and Samantha has her hands full. Samantha is not an entirely likable character, and she has made some questionable decisions. Thanks to Clark’s experience with the justice system, these problems feel logical and believable. Most of the characters in the book are a mix of bad and good, and this makes the book quite readable. Samantha is not above bending the rules a bit, and this makes her a more complex and interesting character. While I am not usually a fan of police procedurals/legal thrillers, I found myself wanting to read this book and turning the pages quite quickly. 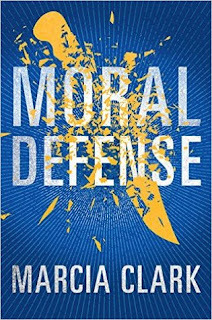 Easy to read and exciting, Moral Defense is the perfect way to immerse yourself in a who-done-it (or how-they-did-it) novel.